In this video, I discuss how we can remove contradictions between different requirements when we develop new organizational models. One way to avoid contradictions is to focus on a very narrow set of activities – to reduce the number of products, customer segments, regions or technologies. In general, focus is good – but what do you do in a large organization, where you inevitably will have a broad set of activities? 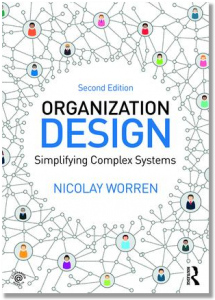 When designing an organizational model for such a firm, there will likely be conflicting requirements. It’s important to detect what these requirements are and to try to resolve them. The idea I describe for how to deal with this problem is characterized by some leading thinkers as the essence of effective design. Let me know if you have any questions or comments! **I guarantee 100% privacy. Your information will not be shared. I am an associate professor in Leadership & Organization at the Norwegian University of Life Sciences. If you are new to this blog, take a look at previous posts or read about my background here. Should you use agile principles to organize a firm? The purpose of this blog is to provide research based advice for managers who want to design a more effective organization. I am an associate professor at the Norwegian University of Life Sciences. See the "About" page for more details. Should there be a computer on your organization chart?